IKA’s easy-to-use homogeniser systems have been carefully developed to deliver efficient, high-quality results during a range of laboratory homogenising, emulsifying and suspending operations. The digital display allows you to monitor the speed of up to 24,000rpm. 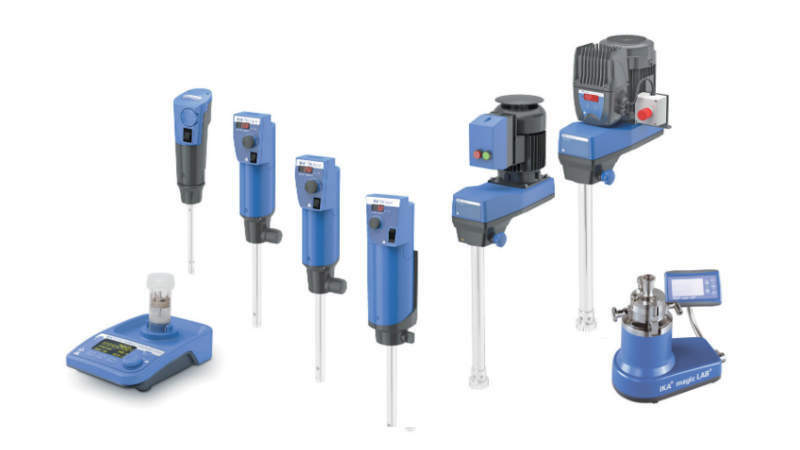 Due to their broad spectrum of dispersing tools, IKA dispersers are suitable for various experiments and applications including homogenisation of effluent samples, dispersing tasks under vacuum pressure and polymerase chain reactions (PCR) analysis. IKA dispersers are used for volumes ranging from 0.5ml to 50,000ml. The high-performance drive ensures immense speed stability. A large variety of dispersing shafts allow for flexibility in experiments. IKA’s compact and patented ULTRA-TURRAX Tube Drive system is the world’s first disperser system with disposable and sealed sample tubes. Multiple tube styles are available for mixing, homogenizing, and grinding for a large number of applications. T-series homogenisers are designed for the mixing and dispersing of products for widely ranging viscosities. This series of dispersers enables the best possible results for any application. IKA’s dispersers have a high-degree of scalability, helping to ensure reliable scale-up by offering the possibility to use the same method starting in formulation and taking it to production.